"In May, we upgraded our iPhone app to allow users to make calls over 3G data connections. Today, I’m pleased to introduce a brand new version of the app. It allows you to make calls with high quality sound, and supports multitasking. 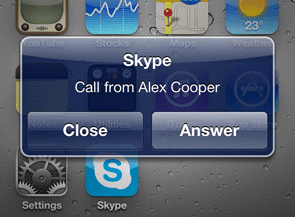 This means you can receive Skype calls while other apps are running, even when your iPhone is locked. And during a call, you can keep the conversation going while you switch to another task, such as checking a movie listing or reading an email..."